Cliquez ici pour écouter l’interview de Schmitt/Charbonnier sur YouTube. For readers of the Florent Schmitt Website + Blog, we are pleased to provide a link to a rare taped interview of the composer, done in 1954 when Schmitt was 84 years old. Georges Charbonnier (1921-1990), long-time executive producer at France-Culture (ORTF). 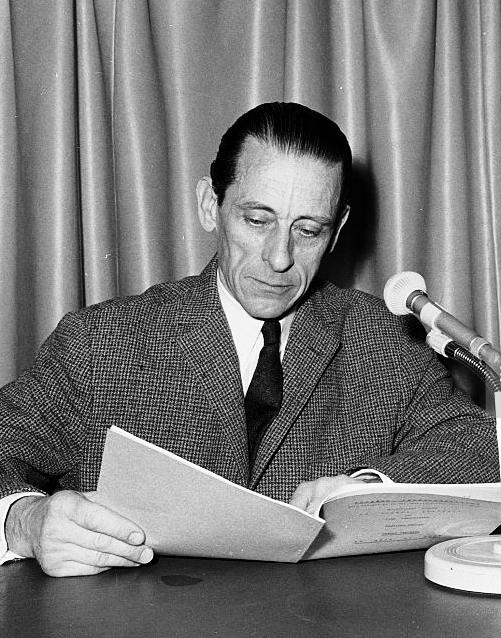 The interview was conducted by Georges Charbonnier, an important executive producer at the French National Radio & Television in the 1950s and 1960s. Charbonnier was particularly famous for his ability to ask insightful questions that resulted in some truly meaty and memorable responses. Among his interview subjects were such luminaries as the artist Marcel Duchamp, the anthropologist Claude Lévi-Strauss and the composer Edgard Varèse, in addition to Florent Schmitt. Thanks to the 1954 Charbonnier interview, we have the opportunity hear Florent Schmitt’s thoughts and perspectives on a variety of topics, expressed in the composer’s own words. For example, Schmitt speaks about the rise of electronic music — then becoming the rage in France, Germany and other countries — as reflecting a kind of contemporary artistic “snobbism.” By contrast, in his view the true essence of music is in its ideas and emotions, rather than any scientific or technical aspects. In his interview remarks, Schmitt also expresses a certain ambivalence about concert audiences. On the one hand, a sizable segment of the audience insists on hearing the same famous compositions by the same famous composers, instead of being open to less-familiar fare. On the other hand, a smaller but highly vociferous group seems obsessed the avant-garde to the exclusion of nearly everything else in music, in Schmitt’s view. When Charbonnier asks Schmitt to define what “tradition” means in music, Schmitt responds by declaring that the term has lost its meaning — although he names several composers who he feels have been upholding a sense of tradition in music — such as Raymond Loucheur and Claude Delvincourt in France, Jean Absil in Belgium, Óscar Esplá in Spain, Goffredo Petrassi in Italy, Carlos Chávez in Mexico, and Serge Prokofiev in Russia. When Charbonnier asks Schmitt to comment on how he feels about his own music and his favorite compositions among them, the composer has an interesting response. The pieces that interest him the most are the ones he is creating at any given moment in time, whereas little by little, he begins to feel more indifferent about his older compositions. There is more material that Charbonnier covers in the 15-minute Schmitt interview, which will be fascinating to hear for those who can understand the French language. You can listen to the interview here, courtesy of YouTube. But even if you don’t understand French, the interview is well-worth hearing in that it contains an excerpt from one of Florent Schmitt’s greatest late-career choral compositions, Cinq Chœurs en vingt minutes, composed in 1951. We are treated to Schmitt’s chorus-and-orchestra version of the first of five pieces in the set: “Le Ceresier” (“The Cherry Tree”), beginning at approximately minute marker 9:30. 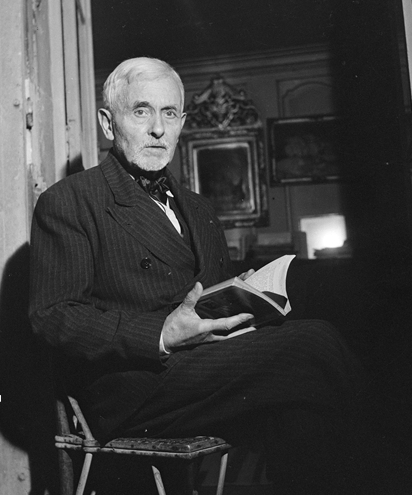 We are indebted to two gentlemen for unearthing this rare interview and making it available to music lovers today: The Franco-American conductor David Grandis, music director of the Virginia Chamber Symphony and the College of William & Mary Symphony Orchestra; and Nicolas Southon, French musicologist, author, and specialist in the life and artistry of Francis Poulenc and Gabriel Fauré. It is particularly special that the Charbonnier interview was captured just a few years before the end of Schmitt’s long and eventful life. It was a career that coincided with the most significant period in the history of French classical music — and indeed, within which Schmitt was intricately entwined. This entry was posted in Choral Music, Classical Music, Composers, French Composers and tagged Carlos Chavez, Carlos Espla, Cinq choeurs en vingt minutes, Claude Delvincourt, Claude Levi-Strauss, Florent Schmitt, Georges Charbonnier, Goffredo Petrassi, Jean Absil, Marcel Duchamp, Prokofiev, Raymond Loucheur, Schmitt, Varese. Bookmark the permalink. « Habeyssée (1947): Florent Schmitt’s rich and colorful suite for violin.